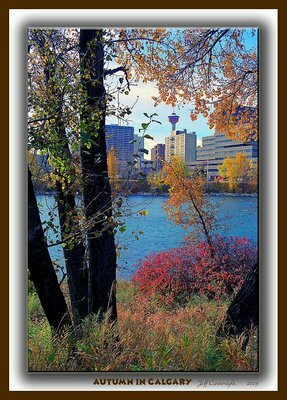 Image Title: Calgary Fall Colours! About Taken with Canon EOS650....24mm Wide angle...During Fall of 2003...Jeff! Hope all is well My Friend! How are things in Calgary??? Great shot form the archives Jeff! Another beautiful Calgary photo. Perfect framing, exposure and color capture. I've visited in early September. Guess is was 30-40 days too early for the colors, but, it was warm and comfortable. Simply beautiful! The colors of autumn naturally framing a great city scape. Well done my friend! These are really great autum leaves... Esplendid composition and great colors!!!! Good to see you in the home page... Congratulations!!!!! Congratulations on being featured, Jeff! Great shot! Marvelous image, Jeff. I like so much the point of view of the City with nice colors of the leaves. Nice moment with light. Really a composition very pleasant. 7+ and in my fav. Nice to know that there are such beautiful places to get away to so close to a city. Great colors! What a geat view, Jeff! Beautifully composed pic, gorgeous colors. I like the amount of saturation you used. Wow, Jeff, this is really coloful and well framed! There's such a wide palette of colors that you captured here. Niiiiiice. Wonderful colors Jeff! beautiful composition! A delightful peek through the colorful foliage. Very nice photograph of what is quickly becoming one of my favorite places! This is like two pictures in one! I like it! I am coming to the conclusion that we need to spend 12 months in your beautiful country Jeff. Don't think there is a "Best" time. This is so beautiful and your presentation is great. Super shot, Jeff ~ great autumn colours. Very beautiful. Great saturation. Good work, there's interest and information from foreground to background, the city is nicely framed by the vegetation, looks fantastic! Nice one Jeff, good juxtapositon of nature and city scapes, I too can't wait until those fall colors start showing up, but I will have to enjoy these summer months now!